​Genuine and CertifiedLab created diamonds, also known as engineered or cultured diamonds, are grown in highly controlled laboratory environments using advanced technological processes that duplicate the conditions under which diamonds naturally develop when they form in the mantle, beneath the Earth’s crust. Created Diamonds are chemically, physically & optically exactly the same as mined diamonds and are real diamonds. The only difference is the point of origin. All our lab grown diamonds are certified by independent diamond grading laboratories such as International Gemological Institution (IGI) & Gem Certification and Assurance Lab (GCAL). The certificates issued are identical to mined diamond certificates with grading of the 4C’s- Cut, Color, Clarity & Carat. We are proud of our laboratory grown diamonds and every certified stone has a “LAB GROWN” laser inscription on the girdle for full disclosure. The least we owe to the next generations is their right to a just, beautiful and safe environment. We want to bring an end to the devastation caused to the environment and to the wellbeing of people by mining diamonds. Man-made diamonds are driving positive change by making a difference. Our diamonds have no carbon emission, and cause no damage to the surface of the Earth. Supreme ProvenanceOur grown diamonds are the sum of our integrity and shared knowledge. You know the origin, history and authenticity of the diamonds you buy from us. Grown diamonds are created in a high technology greenhouse and thus hold an unquestionable provenance. When you buy lab created diamonds from us, you receive it directly from us - the producer. There are no intermediaries and no risks. Globally AffordableLab-grown diamonds are 20 to 30 percent less expensive than mined diamonds. Scientists and innovators have spent millions of dollars to invent advanced technologies that create real diamonds in specialized greenhouses. Even though grown diamonds require almost equivalent amount of resources, money, time and energy, they are more economical. An increased number of the new generation is embracing this ethical choice as they are bigger, better and value for money. Type IIAMined Diamonds are essentially composed of pure carbon. But many diamonds contain traces of impurities such as nitrogen or boron, acquired during the course of formation. Those diamonds that contain little or no impurities are Type IIa diamonds. Less than 2% of mined diamonds are Type IIa and hence are the purest & rarest form of diamonds. Some of the famous, large Type IIa diamonds are Krupp Diamond, Cullinan, Koh-i-noor and Lesedi La Rona. All our colorless Lab grown diamonds are Type IIA. Consistent and Sustainable SupplyWe are a one-stop shop for lab created diamonds and offer all sizes, shapes, colors & clarities. Our advanced & high tech infrastructure allows us to offer guaranteed, curated diamond assortment programs for our retail & wholesale partners. 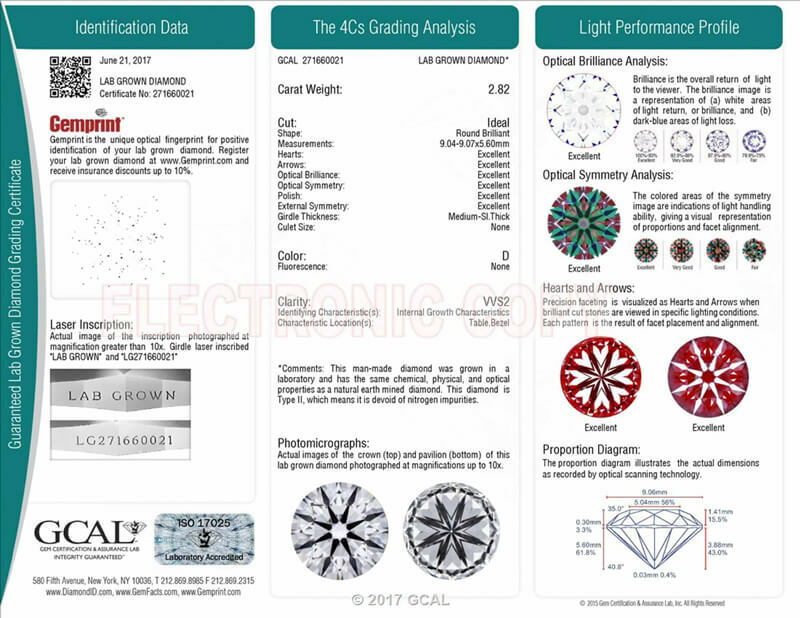 The 4 C’sJust like mined diamonds, every grown diamond is examined by expert gemologists to provide the most rigorous assessment of the four Cs. Cut: Every diamond is a sparkle and a pattern of light. Cut measures workmanship. The cut is what reflects luminous light, brightness, dispersion, contrast and scintillation. Precision craftsmanship in our master studio assure Super Ideal cut. Clarity: A diamond’s radiance is from its flawlessness. Clarity measures diamond flaws, called inclusions, which might appear as tiny spots, clouds, or cavities. Color: Colorlessness is a quality. Color is graded by letters ranging from D to Z, starting with D for most rare & colorless diamonds. Carat: Carat is a weight and size measurement. A 1-carat diamond weighs 200 milligrams. But there’s no ideal size for a diamond. It depends on budget and taste. Small diamonds are less expensive than larger diamonds.